And with that leaderboard we will sign off for the day. A reminder, you can watch highlights in this page now, click 'live coverage'. The tee times for Friday can be accessed by clicking here. The report from Thursday by clicking here. The best shots of the day are here. Click golf at the top of the BBC Sport website homepage and you'll find quotes pieces galore too. Jordan Spieth showed the field how a steady round of links golf should look, though a couple stuck with him in their own slightly less graceful way. Rory McIlroy was anything but graceful but boy did he dig in. Like a boisterous child with a bucket and spade, he dug and dug. Maybe tomorrow he'll bring his JCB and really pose some questions. We will be live texting from 0630 BST. Co-clubhouse leader Brooks Koepka needed just 21 putts today. That, according to the European Tour, is the fewest of any player at The Open since 2008. Jordan Spieth needed 22. That's why they're up top. And of course, if you tune into the highlights, wear sunglasses when John Daly is on. Just a quick pointer for you. The highlights from today are currently on BBC Two and also at the top of this page. They will stay running at the top of this page until 22:00 BST. First out on Friday... BEEF. Then here are some selected others. Remember, the forecast shows the morning weather will be better. For a full list of start times, click here. This is tomorrow's forecast, according to the BBC website. If you're teeing off first then you are one of the lucky ones. I'll bring you a list of start times shortly. Rory McIlroy speaking to BBC Sport: “I am proud of myself for hanging in there, staying as positive as I could. I wasn’t very positive, my caddie JP was a big help, he kept me as positive as possible out there and tried to remind me I won this thing before and not to feel any pressure, to play my game and you will be ok. The last 12 holes that is what I did. "I was down on myself, disheartened with some of my shots. It is so hard to see good stuff in practice and not happen for you on the course. The last 12 holes came together better for me. I can bring the feeling from the last 12 holes into the rest of the week now. "I am pretty close judging by last the 12 holes I just played. After six I felt out of it and it looked like another weekend off. But after the next 12 holes I am right back in the tournament. It shows how fickle golf can be. I feel like I have found something out here these last 12 holes and I have to try and go with it for the rest of the week." As the late starters filter in, it's safe to say that was a day with plenty going on. Ian Poulter got out sharp, Jordan Spieth played as steadily as a chess Grandmaster and Rory McIlroy got into a fight with himself, overpowering a woeful opening to carve out something respectable. Prize money at the Open has been a big deal this year because for the first time, the winner will be paid in US dollars. Around $1.8m converts to some £1.4m give or take. Whatever the currency it will be a lot more than the £1,400 Arnold Palmer got for winning in 1961 or the £2,100 Jack Nicklaus got for his first Open win. Also of note is the fact than in 10 years since Tiger Woods won £500,000 for victory, the winner's share has almost trebled. Rafa Cabrera-Bello finishes his opening round with a bogey at the 18th. The Spaniard will be disappointed with that, having had the chance to join the overnight leaders on day one. Instead, it's a three-under-par 67 that leaves him two strokes off the lead. There will be no penalty for Jon Rahm on the 17th hole, says Press Association golf correspondent Phil Casey. The Spaniard also escaped a penalty when he won the Irish Open earlier this year. Then, Rahm was four clear on the 13th fairway when a query over his ball marking on the sixth green caused a concern. But no penalty was imposed and the 22-year-old went on to finish six shots ahead of Richie Ramsay and Matthew Southgate. Hampshire's Richard Bland has only played one in Open Championship before, also here at Royal Birkdale in 1998, when he matched the score of five major winners, Paul Azinger, Padraig Harrington, Bernhard Langer, Paul Lawrie and the great Tom Watson - but missed the cut by three shots. On his return to the West Lancashire coast 19 years later, the 44-year-old from Southampton ended the day a lot higher up the leaderboard, on three-under 67, after finishing with three straight birdies. The only downside was being one of the lucky few chosen at the end of his round for a random drugs test. The same fate as his Hampshire colleague Justin Rose, the world number 14, half an hour earlier. "I got hauled in for that too," grinned Bland, joking: "They must have got a vendetta against Hampshire golfers." App users may need to click the link. Tune it to watch the best of what has been a superb day’s play. Great crowds, great course and the sun has shone. Ian Poulter got off to a flying start in cold conditions this morning. He looked more confident on the greens and his round of three-under 67 as one of the earlier starters was tremendous. Jordan Spieth said he was a nine out of 10 in every department today and you can’t disagree, his was a glorious round of golf. Near flawless, he was a man in complete command of his game. Fellow American Brooks Koepka had one of those days on the greens, holing absolutely everything. England's Paul Casey has been playing some nice steady golf for a quite a while now. He turns 40 tomorrow, so it’s big day all round for him. The day’s disappointment was obviously Rory McIlroy's start. He has made a brilliant battling comeback, though, after his nightmare beginning to keep himself in there. 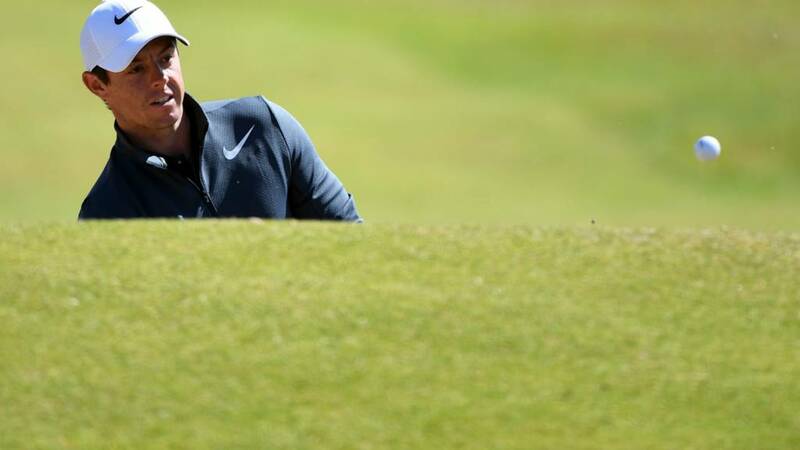 Rory McIlroy has been talking to BBC Radio 5 live after his round of two halves. He took 39 for the first nine and 32 for the second. "I am just trying to remember the last 12 holes and scrub the rest out of my mind," he said. "It was a rough start, I was just indecisive out there. Mentally I was not engaged and I was half caught between playing the golf shot I needed to and my golf swing. "My caddie JP gave me a talking to on the sixth tee which helped to keep me positive. He tried to remind me who I was and I had won this tournament before. He told me not to feel any pressure and to play my game and I started to play my game after that. It was nice to make birdies coming in. At least I feel I got myself back out of the hole I was in and get back into the tournament. "I'm encouraged about what I saw on the back nine and will try and go out and do it all again tomorrow and limit the mistakes. I played 12 good holes and hopefully that will keep the run going." Phil Mickelson starts his shot on the 18th fairway left and in she comes, drawing beautifully to leave 15ft for birdie. He can't convert though and it's no birdies all day for last year's runner up. Marc Leishman has finishes well, birdie on 17 and now he has six feet for another... misses. Rafa Cabrera-Bello can't take a chance to join the leaders as his birdie putt on the 17th goes begging. It never really had the line, drawing left too early and finishing a foot or so to the left of the pin. He taps in for par and moves on to the 18th needing a birdie to join the clubhouse lead. On the 17th, a par five, Jon Rahm hit a tee shot right in thick stuff on the left-hand side. When he got there he moved one of the long, stringy branches of bramble and when he moved it, it was over the line of his ball. In the end there was a ruling and he ended up a with two-shot penalty for moving an immovable object.